are there differences between prime focus and offset dish installation and pointing. The angle of 22 degrees subtracted from true elevation will give the final elevation for offset dish. is this correct ? is it the same for offset feed horn assembly to be installed at lower edge of dish or upper edge of dish ? because i have seen both. If you have a 22 deg Offset dish. If you want more, say 30 deg beam elevation, tilt the top back by 8 deg. If you want less, say 18 deg beam elevation, tilt the top forwards by 4 deg. A "prime focus" or, more correctly, an "axi-symmetric" dish is truly circular and the feed assembly is mounted on 3 or 4 equal length struts.� The beam direction is at right angles to the plane of the rim of the dish. The feed assembly is on the centre line of the beam and does obstruct the beam to some extent. To set up the beam elevation angle, start with the dish pointed to the horizon (0 deg elevation) and tilt the dish upwards till your required beam elevation is reached.� Use an inclinometer if there is no scale on the mount behind the dish. 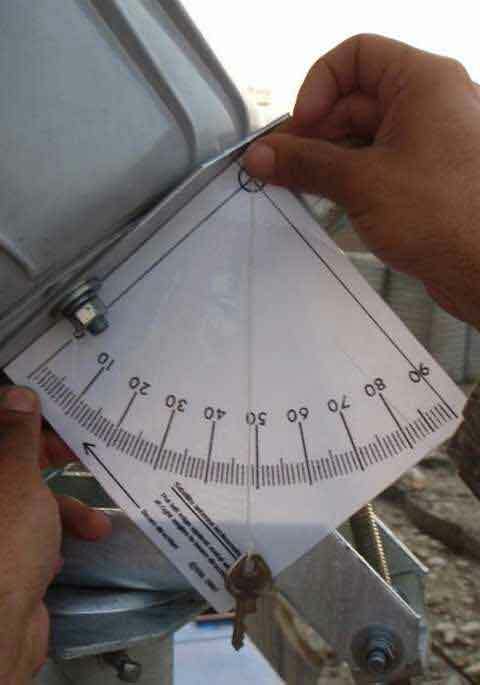 Make an inclinometer if necessary. Large antennas, 4.5m+ diameter, are generally axi-symmetric, often with a small subreflector. An "offset" dish has its feed assembly to one side, so as to not obstruct the beam, and the feed assembly is mounted on the end of a strong support strut, possibly with two additional thin side struts. The rim of the dish is not exactly circular and may not be flat. Virtually all receive-only domestic satellite TV antennas and most transmit/receive VSAT antennas are offset designs to avoid the degradation caused by scattering and blockage of the beam by the LNB/Feed assembly. If the "offset" dish is mounted with the rim vertical and the feed arm at the bottom, the beam direction is upwards at an angle called the offset angle. This angle varies from one manufacturer to another, 22 deg is only one example. The picture above shows a 30 deg offset dish. You need to check the angle for your particular dish. 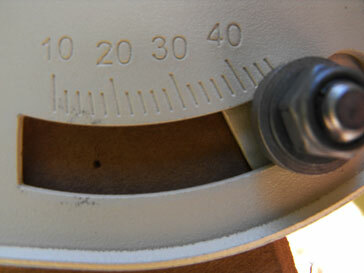 Most "offset" dishes have an elevation angle scale on the bracket behind the dish. In the above picture the reference mark is the edge of the white metal behind the slot, at present showing a setting of 36 deg beam elevation angle. Some "offset" dishes have wedge shaped box behind. The rear face of this wedge is at right angles to the beam direction and is a suitable place to put an inclinometer. There may be a facility to rotate the polarisation of the entire dish using a polarisation scale disk on the rear of the wedge shaped box. If you operate with a very low beam elevation angle (0 to 15 deg), for example, for a terrestrial point to point or WiFi application, then the dish may be mounted upside down with feed support arm at the top. you explained it more clearly and understandable way. surely i have learnt a lot from your information.